After they’re rescued, they spend a single night together, wandering the darkened streets and marveling at the rare appearance of stars above Manhattan. But once the power is restored, so is reality. Lucy soon moves to Edinburgh with her parents, while Owen heads out west with his father. 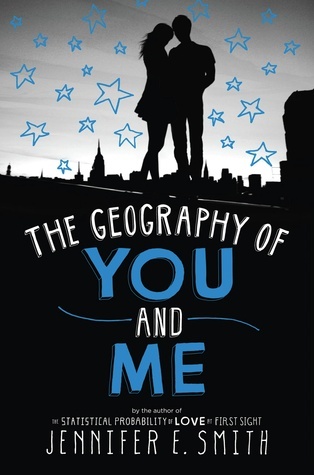 Lucy and Owen’s relationship plays out across the globe as they stay in touch through postcards, occasional e-mails, and – finally – a reunion in the city where they first met. I thought Geography was really cute! Of course, I didn’t love it like Statistical Probability, but I still liked it! I don’t know if I’m the biggest fan of Lucy and Owen. I mean, I liked the part in the elevator, and I really wish they spent more time stuck in the elevator. I’m not sure what I expected with their relationship, but it felt like a lot of waiting for them to finally see each other after moving, and I felt like there was a lot of regret on their part. Which I get but I just really wanted to see them see each other again. It just didn’t seem like their connection was all that strong, and I think that’s why I had trouble rooting for them- I was just as fine with them not being together. And that’s never good for a cute, fluffy romance. I thought there was too much filler, and while I don’t mind it (in small doses), it also made the book feel really slow and forced. I wanted the warm, fuzzy feels, and I don’t think it delivered on that because of the fact that the characters didn’t interact a lot after they both moved…and yet, they hated that they weren’t around each other. It didn’t make a lot of sense to me. But I liked the idea of e-mails from one person and postcards from the other. And I liked seeing them travel all over the place- Lucy in Europe and Owen in the U.S. I did like the fact that the book was open-ended- it makes me wonder how things turned out for the characters (hopefully better than what we saw in the book). 3 stars. It’s cute and fun, but I didn’t feel the romance at all.